Ada pertanyaan untuk Hotel Picasso Donghae? Bagi para wisatawan yang ingin menjelajahi kota Donghae-si, Hotel Picasso Donghae adalah pilihan yang sempurna. Dari sini, para tamu dapat menikmati akses mudah ke semua hal yang dapat ditemukan di sebuah kota yang aktif ini. Dengan lokasinya yang strategis, hotel ini menawarkan akses mudah ke destinasi yang wajib dikunjungi di kota ini. Fasilitas dan pelayanan yang ditawarkan oleh Hotel Picasso Donghae menjaminkan pengalaman menginap yang menyenangkan bagi para tamu. Layanan kamar 24 jam, WiFi gratis di semua kamar, binatu (laundromat), resepsionis 24 jam, Wi-fi di tempat umum hanyalah beberapa dari fasilitas yang membedakan Hotel Picasso Donghae dengan hotel-hotel lain di kota ini. 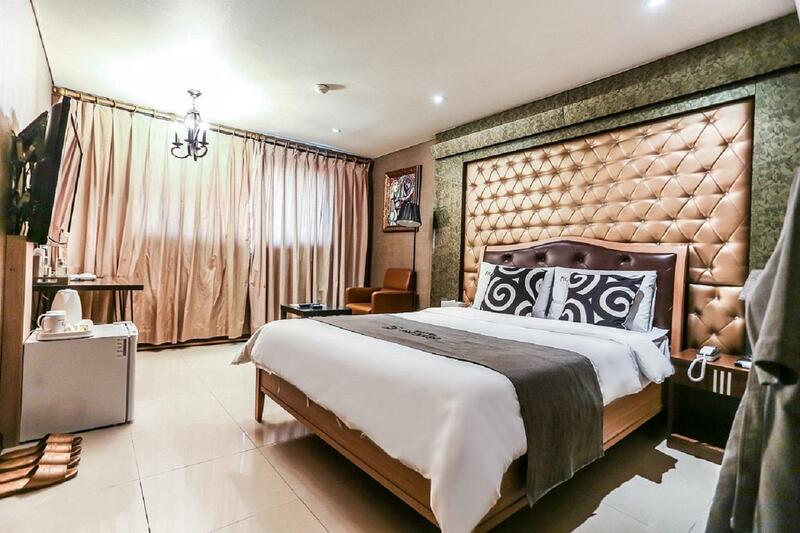 Akomodasi hotel telah dipilih secara cermat demi kenyamanan maksimal dengan adanya televisi layar datar, akses internet - WiFi, akses internet WiFi (gratis), bak mandi whirlpool, AC di beberapa kamar. Disamping itu, hotel memiliki berbagai pilihan fasilitas rekreasi yang menjamin Anda melakukan bermacam hal selama menginap. Hotel Picasso Donghae adalah destinasi serbaguna bagi Anda sebagai akomodasi hotel yang berkualitas di Donghae-si. Its just an amazing place for a cheap price but a very good place...i cant believe its not a 5 star. 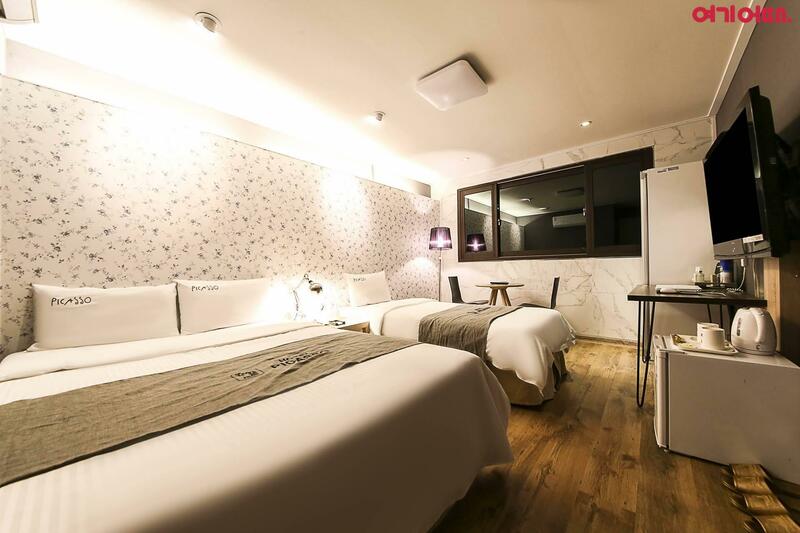 It may be the best budget hotel in the downtown of Donghae City.Truly value for money. I only spent one night at Hotel Picasso but had a good stay in general. The hotel is located behind a main street with lots of eateries and services but was quiet at night. The room itself was comfortable and clean. However, there was a plastic protector on the mattress, which was a bit annoying when I moved. The staff are the front desk were amazingly attentive. WiFi signal was there but couldn't open any browsers. Air conditioning leaked on floor so couldn't use it and it was hot. Good value, rooms are clean, staffs are friendly & helpful. There are lots of restaurant around the hotel. The hotel is located on a small hill, close to a bus stop, which is quite convenient. The rooms were quite spacious and clean, unfortunately the staff didn't speak English. Nevertheless they were very friendly. We had to leave very early so we couldn't taste the breakfast, but they offered two options at the time, one Korean and a Western one. All in all a good budget choice. 1.Room was very clean, 2.Staff was very cooperative, 3.location was very nice. The staff was generally friendly and helpful. After inquiring about a railbike activity during check-in, the staff helped to check the timetable for it and called us at the room to update us. Breakfast was delivered to the room in the mornings. However, the food was cleared too early on the second day and we did not get to eat it. The food was also not very good. I picked this hotel because of the reviews, and I wasn't too disappointed. For a love hotel, it's stellar. The hotel is very nicely decorated and the staff is well trained. My room was clean and the appliances were modern. I never could figure out how to turn the overhead lights on, and so was in twilight most of the time. The room pc only worked one night. The next night I couldn't get it to work. Breakfast was pretty good (chicken rice porridge, sweet bread, banana and hard boiled egg), but was served between 7 and 7:30 am. The most annoying thing was the floor was permeated with a old smoke smell. I aired my room daily and even left the windows open (in January!) to keep the smell at bay. I had specifically asked for a non smoking room. I think it just came from other rooms. The hotel is close to the shopping district, but getting beach access is limited... If you are planning a seaside retreat, this is not the city to do it in. Go to Sokcho or Samcheok. But overall, it was a pleasant stay. I stayed here during a trip down the Eastern Coast. It is located very near food, coffee shops and the supermarket. Taxis are easy to get and it's not a long walk from the coast. The intercity bus station wasn't far away either. The room was spacious and very comfortable. The bathroom was also nice with it's body jets, rain shower and jacuzzi tub. I wish the room had temperature control because it got a little hot at night (it was winter) and breakfast could have been better, but the staff was helpful and I had a great night's rest in the comfortable bed. I definitely would stay here again.